Cape Breton Tourism Spotlight: New Outdoor Adventure Tour Comes To Richmond County, Oban Wilderness Dog Sledding is Up and Running. New Outdoor Adventure Tour Comes To Richmond County, Oban Wilderness Dog Sledding is Up and Running. It is great when we hear about a new adventure tour opening up in the area, especially one offering us the opportunity to get out and enjoy our beautiful winter setting. I am so excited to be able to share the news about Richmond County’s newest outdoor adventure tour, “Oban Wilderness Dog Sledding”. I am hearing more and more from people who have taken the tour and how much fun it was and what an incredible experience, being one with nature. We have all seen dog sledding on TV and in advertisements from up North, but now we to can enjoy this experience right here in Richmond County. It is no longer necessary to travel to the Yukon or up north to enjoy an amazing Wilderness Trail Ride, just give Oban Wilderness Dog Sledding a phone call and you can be on your way to an amazing winter adventure. Don't just wish to be part of such an amazing experience, but become part of the experience, put yourself in the picture you have imagined all these years, sitting back, all bundled up on a sled, being pulled by a team of amazing sled dogs, zipping along the trails in Oban. 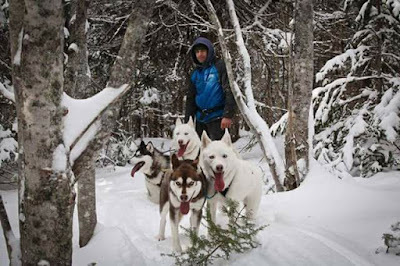 If you are looking for something different in the line of outdoor adventure, wait no longer, call 1-902-824-3286 and book a Dog Sled tour today. The organizers of the Wilderness Dog Sled Tour posts a schedule of tours times for the week on their facebook page, if you are interested in times and cost, check out their site or give them a call. They offer night time and day time tours, for your enjoyment.